The frame of the tennis racket, including the handle and strings, shall be free of any device which makes it possible to materially change the shape of the racket. The frame must also be free of any device that allows the racket to materially change the weight distribution that would allow it to alter the swing of inertia. The physical properties of the racket may not be changed deliberately to affect the performance of the racket during the playing of a point. No energy source may be built into, or attached to, the racket that affects the playing characteristics. 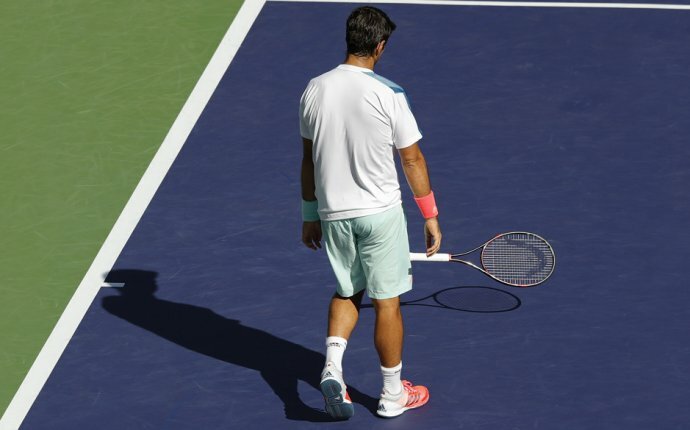 The racket must be free of any device that may provide communication, advice or instruction (either visible or audible) to the player during a match. Length: the frame of the tennis racket shall not exceed 29 inches (73.7 cm) in overall length, including the handle. Width: the frame of the tennis racket shall not exceed 12.5 inches (31.7 cm) in overall width. Hitting Surface: the hitting surface shall not exceed 15.5 inches (39.4 cm) in overall length and 11.5 inches (29.2 cm) in overall width. The hitting surface of the tennis racket is defined as the main area of the stringing pattern which is bordered by the where the strings enter the frame. The hitting surface shall by flat and consist of a pattern of crossed strings. The stringing pattern must be generally uniform and not less dense in the center than in any other area. The racket must be designed and strung so that the playing characteristics are identical on both faces. The racket must be free of attached objects, protrusions and devices, other than those used to limit or prevent wear or vibration, or to distribute weight for the frame.